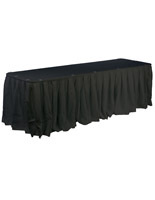 This Professional Table Skirt Ships Fast When in Stock! 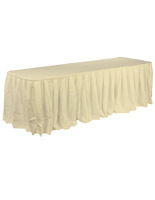 Find All Kinds of Premium Tablecloths and Linens in the Web Catalog! Use a Decorative Table Skirt to Spruce Up Any Decor! 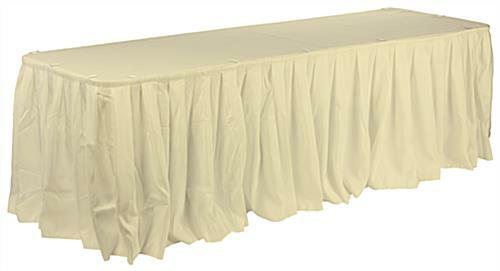 17-1/2' skirting designed to fit both round and rectangular tables. Classic ivory skirting adds an elegant touch to any exhibit. Hook and loop attachment for quick and easy set-up for use in any location. A tablecloth, table skirt has a generous size that can be used to wrap either round or rectangular tables. The 17-1/2' long fabric fully covers a 6' rectangular, as well as 60" or 66" round tables. 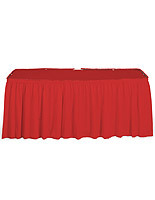 In addition, the table skirt wraps three sides of an 8' or two 6' rectangular tables. A throw is made with hook and loop fabric on the back, which makes it easy to attach the skirting to the edge of a table. A table skirt is ideal for catering halls, restaurants, hotels, trade show venues, meeting rooms and more. Make your presentation look more impressive and outstanding. 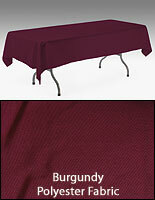 This table skirt is an affordable way to convert your worn out display surface into an attractive presentation. Each is manufactured from polyester fabric that is both machine-washable and wrinkle-resistant.  Made with a classic and elegant ivory finish, this table skirt will complement almost any color scheme. This table skirt, also known as a tablecloth, features box-style pleats to give a finished look of elegance to folding tables. The fabric drapes naturally and smoothly to the floor on all sides.